In March 1860 Lord John Russell attempted to introduce a new Parliamentary Reform Act that would reduce the qualification for the franchise to £10 in the counties and £6 in towns, and effecting a redistribution of seats. Many people in the Liberal Party were opposed to the measure. One MP warned of the dangers of handling the vote to "great masses of half-educated men". He argued that once trade unionists had the vote they would demand the reduction of the working day to "eight hours". Benjamin Disraeli, the Conservative Party MP, was strongly against this measure because it enfranchised 203,000 people in the boroughs and these would cast their votes "all of one class, bound together by the same entitlements and habits - we must recollect that half the boroughs are already under the influence of the new class... we are conferring power on a class". Lord Palmerston, the prime minister, was also opposed to parliamentary reform. He told Lord Russell that his proposal was causing "excitement in the working class" and would give "great power to the agitating but secret leaders' of the unions". He went on to say: "The direct consequence would be an increased and plausible cry for the ballot and the introduction of men into the House of Commons who would be following impulses not congenial to our institutions... Your intended course is openly disapproved of by all the intelligent and respectable classes." Without his support, Lord Russell's proposals did not become law. William Gladstone, the Chancellor of the Exchequer, had been a member of the Conservative Party who had been totally opposed to parliamentary reform in the early part of his career. However, his views changed during a tour of the cotton districts and had been "favourably impressed by working-class qualities". Encouraged by the veteran radical John Bright, he became convinced that large numbers of working-class men could be trusted to exercise the franchise responsibility. On 23rd February, 1865, George Odger, Benjamin Lucraft, George Howell, William Allan, Johann Eccarius, William Cremer and several other members of the International Workingmen's Association established the Reform League, an organisation to campaign for one man, one vote. The organization received financial and political support from middle-class radicals such as Peter Alfred Taylor, John Bright, Charles Bradlaugh, John Stuart Mill, Henry Fawcett, Titus Salt, Thomas Perronet Thompson, Samuel Morley and Wilfrid Lawson. Taylor was appointed vice-president and often spoke at public meetings. On the death of Lord Palmerston in July 1865, Earl Russell became prime minister. On 12th March 1866, William Gladstone introduced the government's new reform bill with the vote going to occupiers of proper in the boroughs worth £7 in rent a year. Gladstone had calculated that while increasing the number of working-class voters, it would still have left them a minority of the total electorate. Probably about one in four men would have been able to vote, instead of the existing one in five. With Conservative opposition to the measure, Russell's government found it impossible to get the bill passed by the House of Commons. On 19th June 1866, Russell's administration resigned and Edward Smith-Stanley, 14th Earl of Derby, became the new Prime Minister. The Conservative Party were once again in power. Benjamin Disraeli, the new leader of the House of Commons, argued that the Conservatives were in danger of being seen as an anti-reform party. He reasoned that if the Conservatives could pilot a reform bill through Parliament, they might gain politically as the newly enfranchised in the boroughs might well vote Conservative out of gratitude. At the same time they could make sure the bill had the necessary precautions to preserve aristocratic power in the counties. 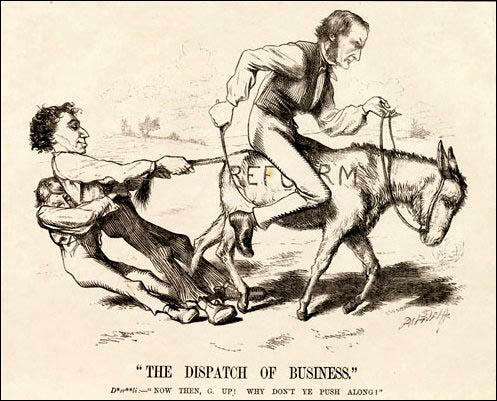 In March 1867 Disraeli proposed his new Reform Act. It was a more moderate set of proposals than had been suggested by Gladstone. Fewer working-class males would get the vote and in addition, university graduates, members of the learned professions and those with £50 savings were to have extra votes. Robert Cecil, 3rd Marquis of Salisbury, resigned in protest against this proposed extension of democracy. 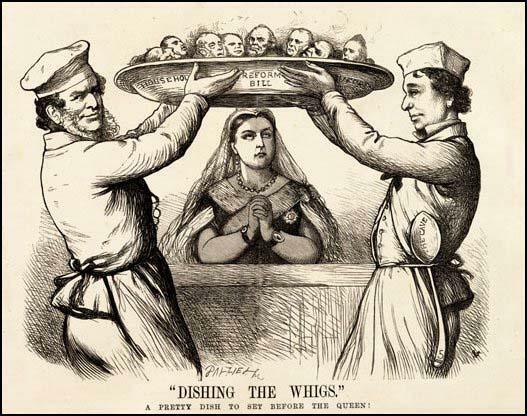 The House of Lords also agreed to pass Disraeli's Reform Act on 15th August, 1867. The 1867 Reform Act gave the vote to every male adult householder living in a borough constituency. Male lodgers paying £10 for unfurnished rooms were also granted the vote. This gave the vote to about 1,500,000 men. The Reform Act also dealt with constituencies and boroughs with less than 10,000 inhabitants lost one of their MPs. The forty-five seats left available were distributed by: (i) giving fifteen to towns which had never had an MP; (ii) giving one extra seat to some larger towns - Liverpool, Manchester, Birmingham and Leeds; (iii) creating a seat for the University of London; (iv) giving twenty-five seats to counties whose population had increased since 1832. (Source 1) Lord Palmerston (starter): "Hi! Gladstone! Democracy! Too soon, Too soon! You mustn't go yet!" I am warmly in favour of an extension of the Borough Franchise, I hope I did not commit the Government to anything: nor myself to a particular form of franchise. I stated that I wished to leave the form and figure open; that I was for a sensible and considerable, but not excessive enlargement. It was a scandal that only one-tenth of those with a vote were working men and that every man who is not presumably incapacitated by some consideration of personal unfitness or of political danger, is morally entitled to come within the pale of the constitution... I do not recede from the protest I have previously made against sudden, or violent, or excessive or intoxicating change.... Hearts should be bound together by a reasonable extension, at fitting times and among selected portions of the people, of every benefit and every privilege that can be justly conferred upon them. The defeat of the Chartists was seen as a defeat for the idea of universal suffrage.... Marx detected a possible shift in this despondent tone when, early in 1865, he heard of a move among the founders of the International Working Men's Association to form a new workers' movement for parliamentary reform. The move turned into that third great meeting, at St Martin's Hall on 23 February 1865. It was addressed by the same speakers as at the International meeting a few months earlier. This meeting voted to establish a Reform League to campaign for one man, one vote. an addition fraught with nothing but danger; we cannot look upon it as a Trojan Horse... filled with armed men bent on ruin, plunder and conflagration. Is it not certain that in a few years from this the working men will be in a majority? Is it not certain that causes are at work which will have a tendency to multiply the franchise - that the £6 houses will become £7 ones, and that £9 houses will expand to £10? There is no doubt an immense power of expansion; and therefore... it is certain that sooner or later we shall see the working classes in majority in the constituencies. Look at what that implies... If you want venality, if you want ignorance, if you want drunkenness, and facility for being intimidated; or if, on the other hand, you want impulsive, unreflecting, and violent people, where do you look for them in the constituencies? We know what those people are who live in small houses... The first stage, I have no doubt will be an increase of corruption, intimidation, and disorder... The second will be that the working men of England, finding themselves in a full majority of the whole constituency, will awake to a full sense of their power. Not the Tories only but the House of Commons hated reform and would never grant it until they could not withhold it. The landlords, army lords, navy lords and law lords, who looked eagerly for a share of taxes for themselves and their dependants, would never let the people's nose from the grindstone if they could help it. But the people had the power in their hands if only they knew how to use it. Let them set their backs up, and show their bristles, and they would get the Reform Bill they wanted. They must show they are prepared to burst open the doors of the House of Commons should they be kept persistently closed against them. He hoped they were not coming to an end of a peaceful agitation... but when an aristocracy declared that the people should not be heard in the councils of the nation ... that was a very dangerous and criminal thing. The people should rise in their might and majesty. If like the raging sea they should sweep on in their righteous indignation, every barrier set up against them - the aristocracy itself - might be swept into oblivion for ever. Whereas it has been publicly announced that a meeting will be held in Hyde Park on Monday the sixth day of May next for the purpose of political discussion: and whereas the use of the Park for the purpose aforesaid is illegal, and interferes with the enjoyment of the Park by the people, and is calculated to endanger the public peace, now all persons are hereby warned and admonished that they will attend any such meeting at their peril, and all her Majesty's loyal and faithful subjects are required to abstain from attending, aiding or taking part in any such meeting, or from entering the Park with a view to attend, aid or take part in any such meeting. 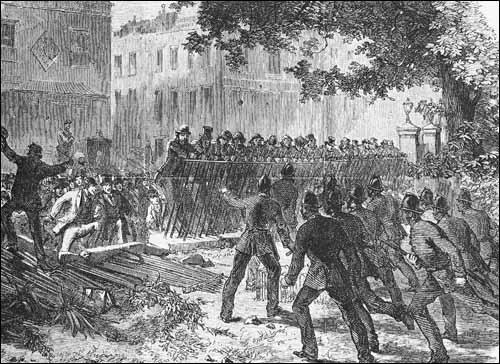 On 6 May 1867 a large-scale meeting was held in Hyde Park to demand reform. Despite back-up support from at least 10,000 police and military, the government was forced to abandon its efforts to ban the meeting on the grounds that it would be impossible to disperse a crowd of 100,000. It was a serious humiliation for the government in that they were seen to have permitted a blatant defiance of the law and to have encouraged working-class solidarity. The fact that significant concessions were made to the proposed reform bill shortly thereafter certainly suggests that external pressures were instrumental in affecting government opinion. The other factor frequently analysed is the precise role of Disraeli during the debates. Why did he resist amendments proposed by Gladstone, which would have limited the franchise, but accept, often with little debate, other, more extreme amendments? It appeared that he was determined to thwart Gladstone and to retain the initiative within the Commons at all costs. Was this the action of a pure opportunist, manipulating the Commons for his own political gain, or was he swayed by the external agitation? Maurice Cowling claimed that Disracli permitted such a large expansion of the electorate because he was engaged in a cynical game of political manoeuvring, designed to retain office and "dish Gladstone". 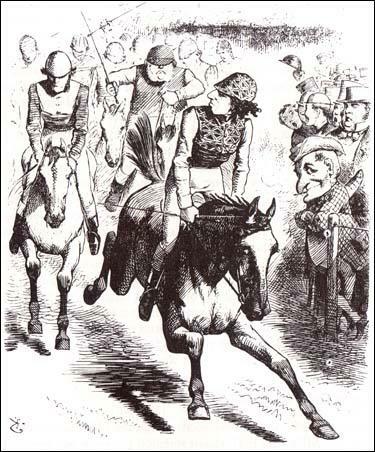 (Source 12) "The Derby, 1867, Dizzy wins with Reform Bill"
Traditionalist Conservatives like Disraeli and Salisbury feared that merely negative and confrontational responses to the new forces in the political nation would drive them into the arms of the Liberals and promote further radicalism. Prudent Tories should provide their own version of "democratic" policies to prevent worse. We do not live - and I trust it will never be the fate of this country to live - under a democracy. England is safe in the race of men who inhabit her, safe in something much more precious than her accumulated capital - her accumulated experience. She is safe in her national character, in her fame and in that glorious future which I believe awaits her. Debate centred on this eye-catching reform, thereby obscuring the fact that voting in the counties, those bastions of Conservative support, would only be minimally changed. It also distracted attention from the area which Bright and others considered even more important than the franchise, the distribution of seats. The legislation would bring about only a small-scale redistribution, to the advantage of the Conservatives in that several county seats shed their urban areas and so became more certain than before to return Conservative candidates. Disraeli played his cards with consummate skill. His was an outstanding parliamentary achievement. He judged correctly that the hunger of his backbenchers for office would overcome their scruples about extending the vote, and he consistently outmanoeuvred Gladstone, whose grip on the Liberal party was shown to be weak. Enough radical votes were won to enable the legislation to be passed.... The Conservative Bill reached its final form in August 1867 and then became an Act. But the Conservatives were undoubtedly gambling. No one could be certain what effect the newly enfranchised would have on British politics. Disraeli hoped that, although the skilled workers were tied to the Liberal Party, the less skilled would vote Conservative... 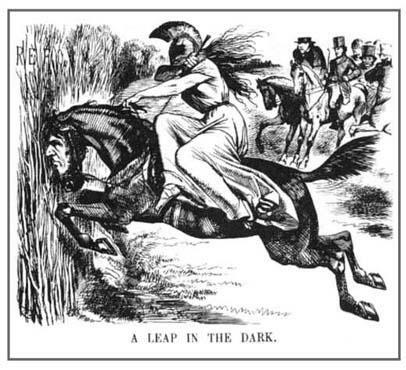 But Lord Derby called the Act "a leap in the dark". 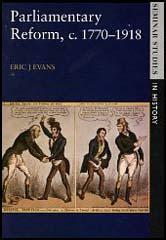 Question 1: Read the introduction and study sources 1 and 7 and explain why the Liberal Party was unable to persuade the House of Commons to pass the 1866 Reform Act? Question 2: Study sources 4, 5, 9 and 11 and explain the role played by the Reform League in changing the minds of politicians on the subject of parliamentary reform. Question 3: Select information from the introduction and the sources that helps to explain why Benjamin Disraeli changed his mind about supporting parliamentary reform in 1867? Question 4: Explain how the cartoonists used horses and donkeys to discuss the issue of parliamentary reform (1, 8, 12 and 15).